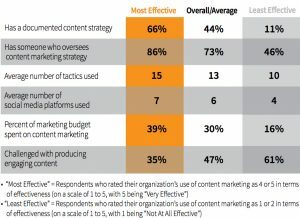 In comparison, only 11% of the least effective content marketers have a content marketing strategy, and 46% have someone who overseas content marketing. 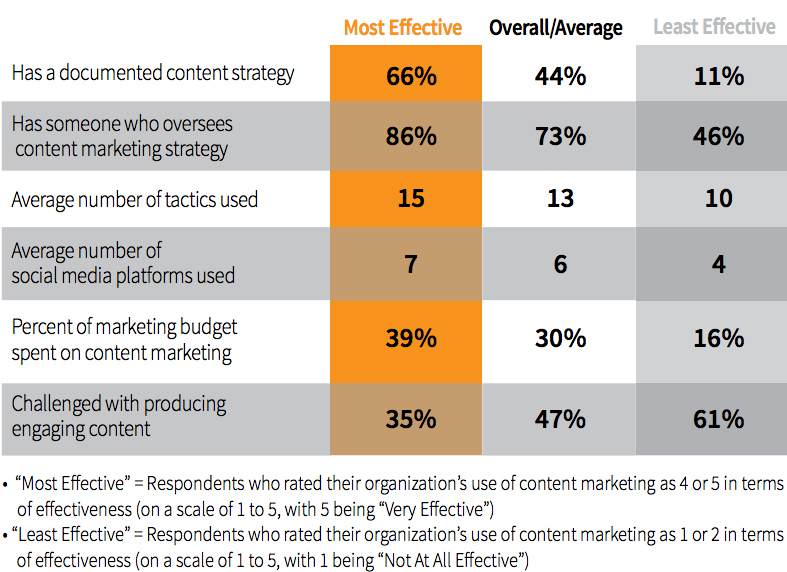 They also spent less on content marketing and find it more challenging to produce engaging content. Content marketing is here to stay, so it only makes sense to get on the bandwagon early. Content marketing boosts website traffic and creates an online funnel for sales leads to help your company grow. Smart marketers know that content marketing is the key to building website traffic and generating leads, but implementing it is another story. A good start would be to assign someone to the task of overseeing this function if you don’t have anyone in place. Without a staff member dedicated to this task, the best intentions go unfulfilled. A key component of your content marketing strategy is identifying opportunities for content marketing and sharing, and without someone dedicated to this task, opportunities will be missed. Large companies with sophisticated content marketing programs generate massive amounts of content and spend thousands of dollars each month on inbound marketing to compete in all their different markets. However, you can boost website results significantly with a content marketing strategy that’s within your means. The goal is to add content to your webste, optimize it for search engines, and distribute it to create incoming links. A simple rule of thumb is the more content the better, but try to create a realistic plan to add content to your website on a regular basis. A good goal for most companies is once a month, but even if it’s quarterly, each update sends a message to Google that something is happening, bringing Google spiders to your site to index the new content and move you up the food chain in search results. You can always step up the pace as your situation improves, but even a small update is a communication to search engines to index your site. Don’t underestimate the value of existing content. Many technology companies have a wealth of valuable technical information at their fingertips, it just needs to be gathered and organized. Start by taking stock of your marketing materials and look for content marketing opportunities. You may already have the content you need to begin a content marketing program, but it’s buried in a website that’s inaccessible to search engines. In many cases, a website redesign will greatly improve the accessibility of the website and create a clear path for search engines to find all those great keywords. PowerPoint Presentations — If you have PowerPoint presentations, upload them to Slideshare and link them back to your website. Videos — Create a You Tube or Vimeo channel with company videos. You can also easily turn your PowerPoint presentations into videos with valuable keywords that link back to your site. Case Studies and Application notes — Post and optimize existing cases studies and/or white papers or develop new ones. Target applications and industries that you want to promote and use keywords from the targeted technology or industry. Share, Share, Share — Look for opportunities to share content through social networking sites, particularly LinkedIn, the number one vehicle for content sharing with 91% of B2B companies distributing content there. Producing engaging content represents a particular challenge for technology companies. Finding someone who can write about complicated technolgy is a challenge in and of itself. Making it “engaging” is even more difficult. However, if your technology solves a specific problem and you write about it clear, concise, language, and distribute and optimize it for search engines, you will have the foundation of a content marketing program. The key is to build momentum and keep it going by adding fresh content on a regular basis, optimizing and distributing it to keep your online sales lead funnel full. For companies with complicated technologies, sometimes it’s not difficult to improve search results. If your website content is specific to a certain product or industry and you keep refreshing and updating it, you can significantly boost search results over time.